For all those people who are interested in the Eurovision Song Contest, here are the results for 2017. The venue for 2017 was the Kyiv's International Exhibition, Kyiv, Ukraine. The presenters were Oleksandr Skichko, Volodymyr Ostapchuk and Timur Miroshnychenko. The semi final 1 was broadcast on Tuesday 9 May 2017 2 hours 10 minutes long. The semi final 2 was broadcast on Thursday 11 May 2017, 2 hours 12 minutes long. 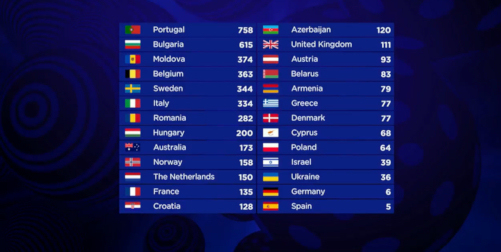 Portugal won the semi final 1, Moldova finished in 2nd place, Sweden finished in 3rd place. Bulgaria won the semi final 2, Hungary finished in 2nd place, Israel in 3rd place. 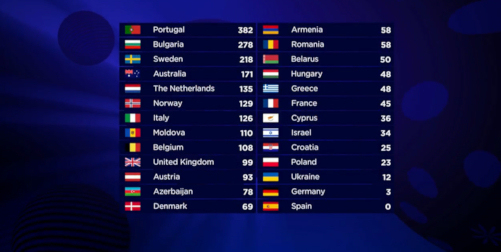 (*) Indicate the number of times that a country was awarded 12 points (by the juries). For Background Details to the 2017 Eurovision Song Contest, please click here.